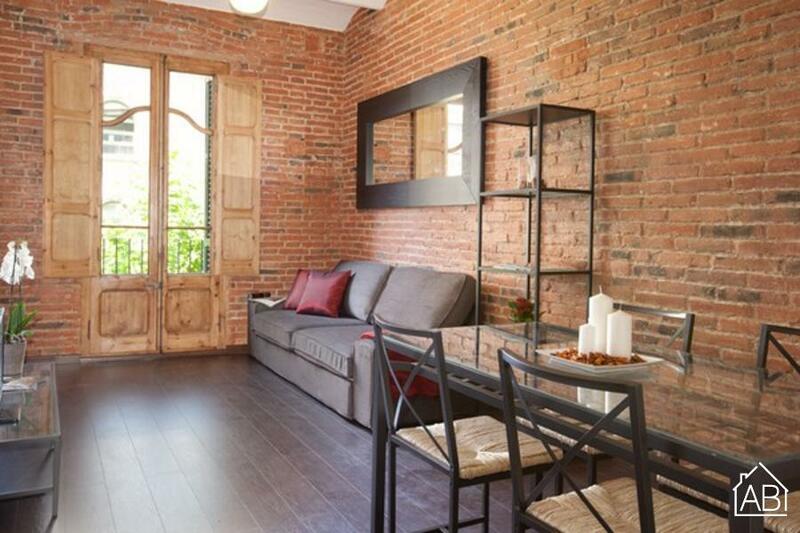 This is a stylish two-bedroom apartment in Barcelona, located in the scenic Eixample neighborhood. it is in close proximity to some of Barcelona´s most revered sights, including Gaudí´s Sagrada Familia. Able to accommodate up to six people in total, this apartment is a great choice for families and couples. This chic apartment welcomes guests upon arrival with a mix of modern and traditional elements, with parquet flooring, open-faced brick walls and French windows, all adding to the ambience of this lovely locale. The living room is furnished with a comfy sofa, and a TV, perfect for relaxing after a day of sightseeing. The French windows open up onto a balcony from where guests can choose to soak up the Spanish sun, or look out over this lovely ´barrio´. An Internet connection is also available, making it easy to stay in touch with friends and family back home. The well equipped kitchen allows guests to prepare their very own home-cooked meal. The apartment has two bedrooms, both furnished with two single beds, and a bathroom, fitted with a walk-in shower. Situated in an ideal location, with easy access to all of the city´s sights, this beautiful apartment, complete with heaters and air-conditioning, is the perfect home-away-from-home, and will ensure that your trip to Barcelona is a comfortable one!